I know we've all been given talents and gifts, and that we're supposed to use our talents for blessing the lives of others. I've often wondered exactly how I can use my sewing talent to bless others. I may have found a bit of the answer today. Elizabeth and liZ over at Simple Simon & Co are hosting a month long series entitled "Skirting the Issue". It's a month of easy skirt tutorials that can be used to make skirts for girls who are in the foster care system, girls who may not have much and very well may feel like nobody cares about them at times. Elizabeth and liZ are encouraging people to use these tutorials to make skirts to donate for these girls. A brilliant idea. You can get more details over there. 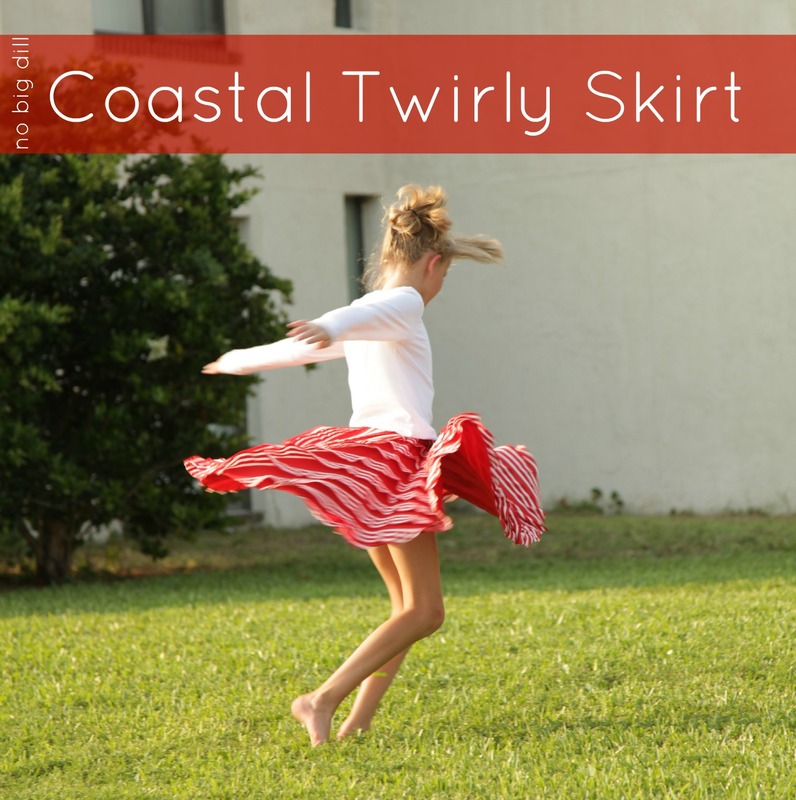 Today I'm sharing a twist on my Coastal Curtsy Skirt for girls little to big, go there for the tutorial. I know you've seen this pre-ruffled fabric popping up in fabric stores all over the place, but I have yet to meet a better variety than rufflefabric.com. They've grown their selection since I was first introduced to them by yards! One of my favorites is the thicker ruffle with the space in between (above on Divine). 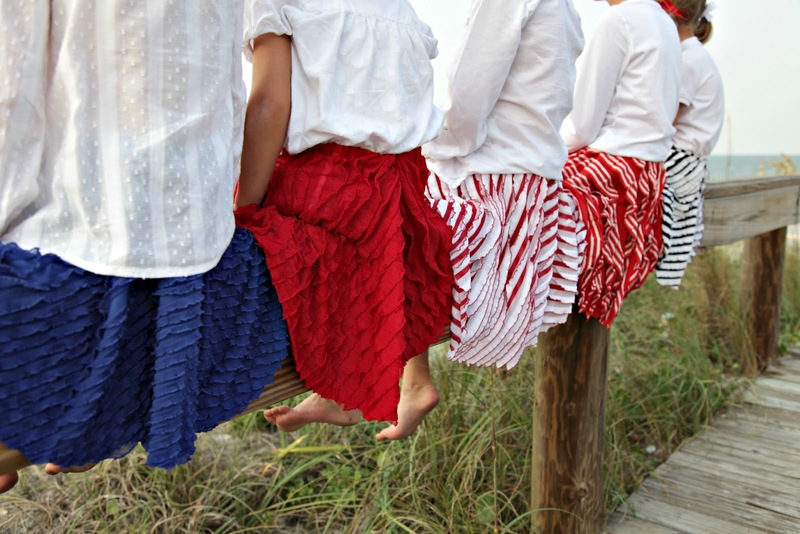 I also love the red/white and blue/white striped ruffles which are a lot sturdier than the more sheer ruffles (the solid red), so they are more kid friendly, lasting longer. These are also a fantastic vacation skirt because they require no special care, just wad them up and stuff them in your suitcase. I hope that some little girls are going to feel loved and pretty! Never played with the pre-ruffled fabrics? How about a chance to win some. Two winners will each receive 2 yards of their choice plus elastic (she's got polka dot, even ruffled elastic which I plan on using for my skirt which is in the queue ;) from rufflefabric.com. ★ Leave a comment to be entered into the giveaway. What makes you feel patriotic? ★ Open for one week (7/10). ★ Please leave your email address in some form if it's not linked to your profile. Also, the Pick Your Plum giveaway is still open for another 2 days! Nice job on the skirts, Katie! They turned out so pretty on all your girls :) I love fireworks on the 4th....last year we had severe drought in Texas and couldn't have any, so I'm super excited about them this year! Every time I see the stars and stripes I feel patriotic! Whenever I spend time in the great outdoors that we've fought to preserve, I feel patriotic! Eating corn on the cob makes me feel patriotic! I guess I just associate it with the 4th because we eat it every year without fail! I haven't ever used the ruffle fabric. Two weeks ago my daughter and I were at girl scout camp. Every morning at flag up ceremony we recited the pledge of allegiance and sang a patriotic song. This made me feel very patriotic. Thank you for the chance to win and happy fourth of July. Thanks so much for the fun tutorial and the great giveaway! I'd love to win so I can make a skirt for an older girl with this fun fabric! I love watching fireworks with friends and family! Being able to pray and seeing others worship in their own way, I think that is the ultimate freedom. When I think about the hardships my mother endured in order to come to America, I can't help but feel grateful for all the brave men and women who fight to make this country worth her struggles. I've played Taps for several services and funerals. Whenever I play that song or even just hear it, I can't help but remember all those men and women who have faught (or are still fighting) to keep this country free. I feel patriotic hanging out our American flag on the front porch. When I see Americans helping other Americans, I feel very patriotic. Happy Fourth! Great giveaway! I think all the red, white, and blue alone makes me feel more patriotic! The whole feel of the day! Love all of it! BBQing at the beach makes me feel patriotic! I feel patriotic when I see people sharing love with perfect strangers. Hey there :) I live in France so I can't really participate but I just wanted to say that I think it's Amazing how American people feel so patriotic! My husband is American and I so want our future kids to feel like that! and love France as much as USA. I'm a Navy wife (and a Navy vet), so it doesn't take much! When I watch the subs and aircraft carriers leave and know how all those brave men and women are leaving their families to go and keep us and the whole world safe. We love the 4th of July at our house. My husband is an Army Reservist and he's been deployed twice so far during our marriage. Seeing the sacrifices of the military families always gets me. And, listening to any patriotic songs. Everytime I leave the US to visit another country, I am reminded how great America is! I don't take my freedoms for granted, so I feel patriotic everytime I get to vote and freely go to church. But the 4th of July picnic with some sort of blueberry/strawberry cool whip dessert just feels so American! Yay! What a fun skirt idea! Music is a huge thing for me that makes me feel very patriotic, I have a whole playlist on my iPod titled "patriotic". :) Also, seeing the wind catch the flag. I do love our flag! Singing songs about our country, and its founders or pioneers makes me feel very patriotic! When I hear patriotic music, in particular the Star Spangled Banner, I cannot help but get that stir in my heart and a tear in my eye! Fireworks make me feel patriotic! My husband, who is an army vet. He is the most patriotic person I know. When I see or experience a sense of inclusive community - that feels especially American. LOVE the skirts. So...I actually just bought the same exact ruffle fabric that Divine is wearing. And...I am making a skirt for Simple Simon & Co with it. ha ha...great minds.. I would love more ruffle fabric though. I feel patriotic when I proudly hang our American Flag in the front yard and see it blowing in the wind as we watch the local fireworks show from our yard. We can't do that this year because we'll be going to AZ, and I'll miss that tradition dearly. Wonderful! Thanks for hosting this. :D I feel most patriotic when I see the photos of our soldiers hugging their kids hello/goodbye. The American Flag, the Declaration of Independance. Focusing on the blessings of where I'm from and the sacrifices so many have made for all of us. Hanging out with friends and sharing many things we are thankful for. All of the patriotic music that is played during the fireworks...I always get the chills! Sparklers, the National Anthem, red white and blue outfits, bbq-ing with family, watermelon and homemade ice cream! I feel patriotic during the Pledge of Allegiance. I never understood it when I had to recite it in school (grades K-2), but now I do. Seeing service members come home to their families, friends and pets always reminds me of the huge sacrifice they make. I feel gratitude and patriotism! The national anthem always gets me, and I love to do sparklers this time every year. We always did them with my grandparents. Our 4th always involves the usual: family, grill, fireworks. What takes it over the top is the Gospel music and the opportunity to honor the service members in our community. Taking the time to recognize the One who died for my sin and the ones who sacrificed for my freedom is the least we can do. Bomb pops in the summer from the ice cream truck are always a good patriotic reminder. Spending time with family, having a nice BBQ outside & staying out in the yard past dark with the kids! I left a comment about the skirts on the tutorial page - but I love these, and will be using them to teach my daughter (five and a half) how to sew this summer. Thank you!!! I love patriotic music- the medley of the armed forces, my country tis of thee, the star spangled banner, you're a grand old flag, etc. :) Maybe I'll make a mix for tomorrow mornings run. Fireworks, parades and family time for sure! This year my family is thinking of our own personal hero, my cousin Landon. He has been in Afghanistan for a few months, and was recently pulled out when they discovered a tumor wrapped around his spinal column. He's now paralyzed from the waist down and is undergoing treatment for the cancer. So many men and women serving us right now! Explaining to my kids why we celebrate independence! I have to say that living out of the country has made me so grateful for the USA! Tomorrow my husband and I will be celebrating the 4th by taking the kids to the park and sharing a picnic. It won't be the same, and we'll all miss the fireworks and festivities but it's important to us that we celebrate it nonetheless! p.s. I have a stateside address too it that is necessary! Ok, first of all, you are a fantastic photographer. I love your whole blog. These skirts are too cute. I am not usually too excited by ruffle fabric, but I totally love the striped ruffled fabric. I would love to make something with it! But as for patriotic, any time I hear about military families, I am always very thankful for their service. Before I had kids, I didn't realize the sacrifice of someone going away and leaving their family. Now I realize what a sacrifice it is. And I appreciate it. My new goal is that any time I see someone in uniform, I thank them for their service. Anytime I see my kids' faces light up when they see the flag it brings tears to my eyes! Katy I love these!!!! :) I feel patriotic when singing or playing the National Anthem (though not on the organ yet- still learning that one). Hearing/singing the Star Spangled Banner always make me feel patriotic. Such cute skirts! I'm going to make some for my daughters too! Family BBQ, fireworks, sparklers, hanging the flag in my house somewhere... all make me feel more patriotic. Watching fireworks and hang out with friends and family is all I need on the 4th! a red white and blue outfit! Sparklers! Sparklers are the essence of 4th of july for me, the best mid-summer holiday ever. Love love love it. Can't wait to make some for some littles at the beach house this summer. I want to try that pre ruffled fabric. Beautiful. Singing the national anthem make me feel sooooo patriotic. I cry (or at least get teary-eyed) almost every single time! I feel Patriotic by displaying the USA flag on our front porch beginning Memorial Day through the end of July. Great giveaway! Thanks for the chance to win. I love seeing soldiers in uniform. I can't help but feel respect for them. I don't live in a military town so I get a lot my experiences at the airport. My church always does a wonderful service on the Sunday closest to the holiday (4th of July or Memorial Day) -- flags, songs, uniforms. A blessed way to remember our country and thank our service men and women! We're a military family, so I feel patriotic simply due to my hubby's job. We now live in the DC area and can't wait to see how they do fireworks here! It's great to be American! I feel patriotic when I buy a poppy from a Veteran, look him in the eyes, and say "Thank-you!" I can't stand all the ads and campaigning that precede it, but voting makes me feel patriotic. And hearing patriotic music, particularly when sung by children kinda chokes me up. Being in the great outdoors! We have a wonderfuly beautiful country! I too, have often pondered how I am suppose to use my gift of creating to bless others. This is a great one. Though, I feel you are already blessing others with your sewing abilities by sharing on your blog. I know your blog has been a blessing to me. Love their fourth outfits! What's Drummer wearing? I love patriotic songs. They always make me teary. I remember the time as a teenager coming home from a month long mission trip to Kenya. Seeing that American flag flying was amazing to me, it was the first time I realized how lucky we as Americans are to be living in a land of such freedom. I would love to win some ruffle fabric and would be more than happy to make some girls happy. Fireworks! It's a family tradition from my babyhood. We watch the show in the park and on a different night find somewhere to light off our own - which generally means my two brothers running around like idiots practically singeing their eyebrows off. I'm not sure that I qualify for your giveaway, as I am in Canada but I wanted to say how gorgeous those skirts are! I will have to scour our local store to see if they sell that type of fabric?! Singing "God Bless America" with my 2 1/2 year old! Being with family and the colors red white and blue! Being at the lake with family, watching fireworks reminds me of my childhood and always makes me feel patriotic! But more than anything to have some patriotism well up inside of me, all I really need is to see our American Flag and listen to the star spangled banner. I love the 4th of July, since 1971 we have been having a family reunion. Get to visit family we only see once a year. Fireworks and Family, LOVE IT!! I have 3 girls that would LOVE something made with ruffles! Adorable. Every time I see someone in uniform I feel very patriotic! And grateful. Music makes me feel patriotic. Some patriotic songs play on the radio this time of year and bring me to tears...and always at events where the national anthem is sung...that gets me! Fingers and toes and eyes crossed for ruffles! So cute! I definitely need some ruffle fabric. :) I can't help but feel patriotic and SO proud to live in this great country, when I see amazing, dedicated, and self-less men and women in uniform. It doesn't matter where I see them, the grocery store, airport, on the street, etc, I ALWAYS tear up and can't thank them enough for their service. We are so blessed! Cooking out with family, watching fire works, and Making fun 4th of July outfits for my daughter!! It would be sew fun to see what I could come up with, with some ruffled fabric. When I see the old veteran's in town marching in uniform behind the flsg at the 4th of July parade or any soldiers in uniform for that matter! I imagine their lives of service to our country and am proud of them. Fireworks, flags and red, white and blue! What a beautiful skirt and such a lovely cause... I will have to go and check out that series right now! I sure would love some of that ruffle fabric for my own little girl and for a girl in need! The 4th of July is my FAVORITE holiday. I love everything about it. But I think my favorite part is when everyone stands up for veterans and soldiers who walk in the parade. I love wearing red, white, and blue in different ways!! wearing red, white and blue makes me feel patriotic, same with having a picnic at the park and watching fireworks with my loved ones. We're big fans of the 4th. It's the only holiday my husband insists on staying home. Going to our small town parade, eating good food and lighting off fireworks. It's hard not to feel that sense of patriotism. When I hear about the freedoms those in other countries lack -- especially when we're fighting those battles with them and for them -- I feel patriotic. Whenever I see Red, White and Blue, or a flag, whenever I hear the national anthem I to tear up my kids always look at me and ask what is wrong. I have been wanting to play with ruffle fabric since the first time I saw your Coastal Curtsy Skirt. Thanks for the giveaway!!! Ooh, I've wanted some ruffle fabric! Thanks for the info on where to get it! My husband was in the navy for 10 years and whenever the aircraft carrier he was on, would come home... The patriotism on that dock... It was awesome. Made you glad you could be apart of this great nation. Also the last few months before he was medically separated, we would have to go to naval San Diego medical center for medical appointments. It was sobering when you saw the injured from war. I always wished i could comfort them in some way. So this 4th of July I'm thankful for our military, their families and the sacrifice they give!!! Leave a comment to be entered into the giveaway. Fourth of July sewing makes me feel patriotic. :) Yay for red, white, and bue sundresses. What a great giveaway! Thanks. I love dressing everyone in red, white and blue, patriotic songs and fireworks. Ooh, this fabric looks so fun! I'd love to win some, since I certainly should not be ordering any more fabric! The Olympics make me feel patriotic. Can't wait to see Canada bring home some medals! I feel patriotic when I see strangers helping out other strangers. Random acts of kindness make me proud! i love a good 4th of july bbq! Or singing patriotic hymns at church! Patriotic Music makes me feel patriotic. You can't help feeling pride in American when you listen to or hear those songs. I love it! What makes me feel patriotic is looking at pics of my five handsome sons all in their uniforms. Four of them in the Army and the fifth in the Navy. I would love to make a special skirt for a young lady in the foster system via "Skirting the Issue." What a wonderful way to use one's talents to bring joy to someone who has had some difficult times. What always brings tears to my eyes, and, I think I can call it patriotism, is seeing the men and women in our military returning home and into the arms of their friends and families. I just sob when I see the surprise welcome homes for unsuspecting kids. They choke me up each and every time. I feel patriotic when I study what our Founding Fathers vision was for this country! But your ruffly red, white, and blue skirts are pretty patriotic inspiring too! Patriotic songs always get me. Always. The skirts are darling. Can't wait to see yours . . . I was hoping I could get away with wearing one too. My husband is in the Navy but we are stationed at a Marine Corps base. Any time I drive onto base or hear artillery fire (that often rattles the pictures on my walls) I feel so lucky and blessed that we have so many men and women fighting daily for our freedom. What adorable fabric! My girls would LOVE it!! I feel most patriotic when listening to taps played by the bugles! My sense of love for country is stirred each time I hear patriotic music whereever it is. Each year I tune in to watch and hear the PBS Capitol Fourth special. I always think of my grandfather who was a Veteran of the Spanish American War and WWI. He took care of his fellow vets until he passed away. Oh! I love ruffle fabric! I think the patriotic songs I learned as a child continue to resonate. the American flag, waving gracefully in the breeze, makes me feel patriotic. I come from a military family, so honestly it doesn't take much to make me feel patriotic, but I am always at my proudest when listening to both my parents swap stories of Army life with my newly commissioned brother. Chatting with my nephew who is serving in the navy and just returned safely from assignment in the middle east makes me feel patriotic and grateful that he is back in the U.S. The Star Spangled Banner makes me swell with pride for my country! For me it is all about the fireworks!!!! I love when we sing the Star Spangled Banner at our 4th of July service at my church! I am in the choir and it gives me goosebumps to hear it sung so loud and proud! I also love seeing the sparkle in my kiddos eye when they watch fireworks! I love this holiday! i think seeing parades and military personnel in uniform puts me in a patriotic mood. I love watching our athletes win a medal at the Olympics and hearing the national anthem play! We are going to watch fireworks and eat potato chips!. I tried this pattern on my self this June and had a fail. i would love the chance to try again. The music they play during fireworks always gets me feeling patriotic. I feel patriotic when my family and I attend parades together. There is something about being next to a bunch of our countrymen that makes me feel a part of something larger! I love hanging with family and watching the faces of the littles as the look up at all the pretty lights in the sky. Being away from home for far too long. Hearing the National Anthem...I love it. The National Anthem. I have always loved this skirt! Watching the Trooping of the Colours always does it. My husband is a great traditionalist so we end up watching it on TV every year - not only are the soldiers honouring the Queen but we get to honour our serving soldiers. And listen to great marching/mounted bands. I've been ogling all kinds of ruffle fabric for months now! would LOVE to try it! i can't sing America the Beautiful in church without stopping due to the lump in my throat - it is such a beautiful song that makes me feel patriotic to the point of tears. love that song! Defending my country in arguments with people from other coutries. Colors make me feel patriotic, and since we have the same ;-) ... but if I were american it would definitly be stars! Flags and flag colors, as seen in the skirts, make me feel patriotic. I would love to win me some ruffled fabric! My email addy is marysews at gmail dot com. When I see our veterans--any day of the year, wherever they may be--I feel patriotic and proud! Our flag, baseball and my mom's potato salad! I feel patriotic everytime I think of my Dad who was in the Marine Corp for over twenty years, he loved this country! My Dad served over twenty years and retired Air Force. I am so proud to be his daughter. I live fairly close to a military base now and every time I hear those jets fly over my house it makes my heart beat stronger. I'm always honored to tell a Vet, Thank You! The National Anthem, I get goose bumps every time. How fortunate will those girls be to receive a beautiful skirt sewn by the talented Katy Dill, I think that is such a great idea. I'm participating in Skirt the Issue. Such a fabulous idea! What makes me feel patriotic? When I see people do good things for each other...especially strangers. When people get up for an elderly person on the bus. When someone pays for an item for the person ahead of them because they don't have enough money. When people are kind. My birthday is near the 4th so we always had a big family celebration. I love going all out with 4th of july outfits for my girls! I love to wear red, but on the 4h of July I bust out the white and blue, too. That makes me feel like "hey, I belong here with these other Americans!" Hanging up the red white and blue decorations...fireworks also on years hen the fire danger isn't too high for them. Being German and living in England I sometimes have a bit of a cultural identity crisis. So feeling patriotic is difficult for me. However England has a huge charity culture and I love that. It makes me feel patriotic when we have a big charity event and the whole country pulls together to raise money! Fireworks make me feel patriotic! Of course it is only helped when they are choreographed to patriotic music. One of the things that makes me feel patriotic is just simply being permitted to live out my life according to the way that I know is right and good. There are so many places where people can do so much more than hate with words and there never be any punishment or consequence for hateful action. Not everything is right in this country, and in some things there is even gross unfairness, but I do know that I can raise my daughter to understand love and peace and to practice it. I always loved the time with family and the fireworks! My husband is in the army and at 5pm every day they play the retreat on post. Everyone gets out of their car or stops what they are doing to face the flag. It brings tears to my eyes every time I do it! Seeing the veterans in the parade makes me feel so patriotic! Love the skirts--so pretty and fun. Seeing the flag out side of people's homes. I feel patriotic when the fireworks are booming and the most patriotic songs are blaring through the speakers! always makes me tear up! I love things red, white, and blue. :) Very cute dress patterns and fun fabric. I've never seen the ruffled fabric, so I can't wait to see some in person. Also - very interested in learning more about this program making skirts for girls in the foster care system. Sounds like fun! This may seem odd, but having the option not to participate in what to me would feel like nationalist gestures, makes me feel very proud to be American. I am so thankful to live in a nation where I have the freedom to participate in the life of my country in a way that fits who I am and is meaningful to me. I am often reminded of those who do not have the same opportunity and freedom. Thanks! Having a flag in the yard makes me feel patriotic. i have been craving some of their fabric, but can't justify the cost. I'd love to win some! It doesn't take much to make me feel patriotic. Anything red, white and blue, especially the flag, gets me going. A soldier in uniform, even police and fire fighters, make me realize what a wonderful nation that we live in. A patriotic song or tune in my mind will stir my American feelings. I am so grateful to be living in a place where we have such freedoms and chances. Blessed be, hugs!!! I love the flag. And I love watching fireworks. July is a great month! So pretty. I grab the chance to cordinate my three littles. I try to go RWB, but not too 4th, so it is wearable all summer. Love watching my littles be in awe of fireworks #magical! Loving on my husband (he was a marine) and for now daydreaming about how to teach my daughter and son to love and honor this great nation. They are 5 and 19 months. Either listening to my father talk about being a soldier in Vietnam or hearing Neil Diamon's "Coming to America" played. My husband makes me feel patriotic as he is a veteran! Being raised as a farm girl, my favorite thing that makes me proud to me an American is seeing classic American made Farmall IH tractors lined up with American flags on each one. Such a beautiful sight! Great history of the hard working American farmer! The flag, the songs about America and being around my daughter who was born with a patriotic soul all make me feel patriotic. Thanks for the chance! i love the skirts. My daughter and granddaughter(s) will love them, too. Singing the Star-Spangled Banner totally makes me tear up and thank God for this country I live in. Seeing our military men and women traveling through the airport....gets me every time. Being with friends of all ages, especially elderly people, and hearing their stories of how our nation has grown together and changed over the years. Learning to live better together even though we are so different is what makes America special. I feel patriotic when I sing The Star Spangled banner. Hello! The Star Spangled Banner and (possibly weirdly) the Olympics make me feel patriotic. Every time I hear "The Battle Hymn of the Republic of the Republic" I feel my eyes welling up with love and gratitude for my country. Those would make cute skirts for my granddaughters!! I would love to try my hand at ruffle fabric; it looks so comfy! Oh I am hoping it's Ok for international entries as I'd love to win this gorgeous fabric. Thanks for your generosity. The colors red, white, and blue! Seeing little girls in stars and stripes with ribbons in their hair makes me feel especially patriotic... Not sure why, but it makes me think of the young and true American spirit. My daughter would LOVE one of these skirts! I'm blessed in my life to know alot of people who serve in the military as well as having family who serve. I know how much sacrifice it is and I'm so proud of men and women like my brother and his family who make that sacrifice. i have five girls also-- who would love ruffled twirly skirts! you will laugh at what makes me feel patriotic-- the grocery store. specifically the produce isles. honest. as i'm filling my cart with rhubarb and pineapple and peaches in the middle of december i want to sing, "I'm proud to be an american!" perhaps this came from the fact that i had a friend in high school who was adopted from ukraine. when she first got here, she didn't believe grocery stores were real. she thought her knew adopted parents had just taken her to a fake, government propaganda store. she made them pull over and go into every grocery store on their way home from the airport. we are so blessed to live here in a land where we can buy anything we want!! i'm proud to be an american in the produce isle of the grocery store. ha!! !